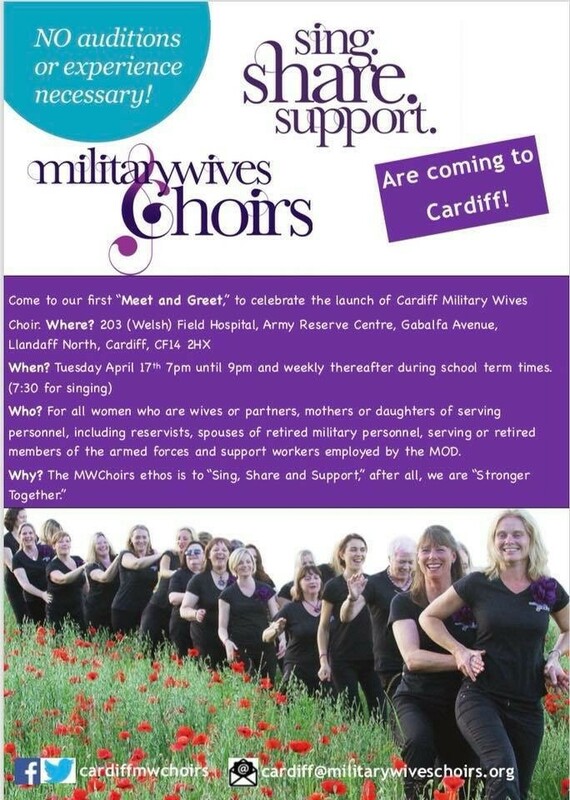 Cardiff Military Wives Choir Caerdydd is reaching out to military women in the South Wales area and inviting them to come together to sing, share and support. Families of service personnel move around frequently and it can often be tough to put down roots or make new friends, which can leave women feeling isolated. With research showing that singing in a choir can help to alleviate stress and improve aspects of mental health, this is where the Military Wives Choirs, of which there are over 70 in military bases across the UK and overseas, come in. With no experience or auditions necessary to join, Cardiff Military Wives Choir Caerdydd based at 203 (Welsh) Field Hospital, Llandaff North, Cardiff is a fun and safe space where any woman with a military connection can take time for themselves to make new friends, share experiences and sing side by side with a group who understand the nature of forces life. Women are offered the chance to be part of unique musical opportunities, performing both within Cardiff and nationally coming together with other Military Wives Choirs across the country. Emily Connick has been a member of two previous Military Wives Choirs and after moving back to South Wales missed the support so much she decided to set up her own choir here in Cardiff. She says the support she has received after suffering mental health issues has been truly overwhelming. The Military Wives community is outstanding! The Cardiff Military Wives Choir Caerdydd will meet together for the first time on Tuesday 17th April 19.00-21.00 at 203 (Welsh) Field Hospital, Llandaff North, Cardiff and weekly thereafter. For more information and to join the choir, contact Emily Connick on cardiff@militarywiveschoirs.org or drop by a rehearsal.